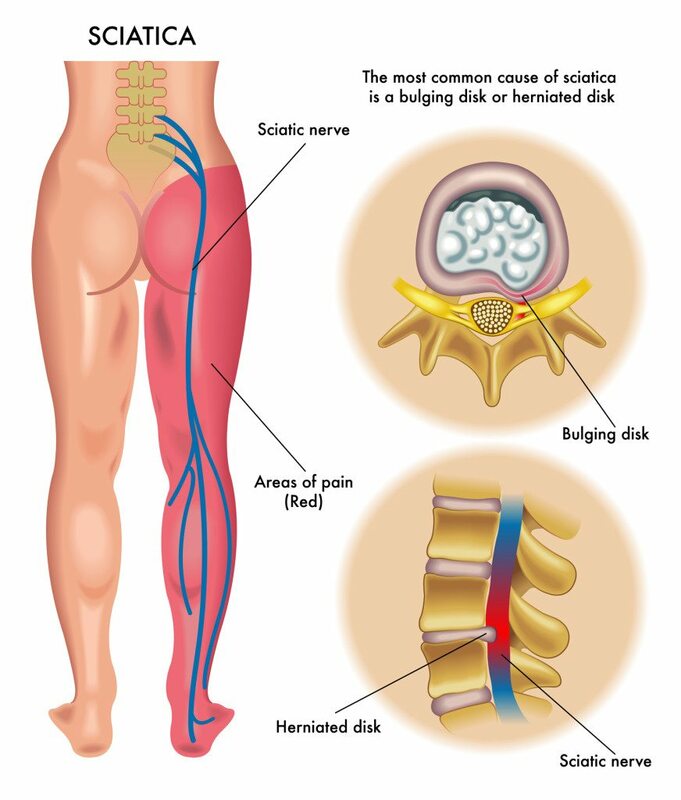 The term sciatica describes pain radiating to the hip, leg and/or foot, generally due to pressure on the sciatic nerve, which causes it to be irritated and inflamed. The low back may or may not hurt, and sometimes instead of or in addition to pain, there is numbness and tingling. The discomfort is usually felt on one side of the body only. 3) by abnormalities of the vertebrae of the low back, as in the case of spinal stenosis and spondylolithesis, in which case the discomfort may be felt on both sides of the body. Acupuncture is quite effective at helping in the first two cases, often alleviating the condition permanently or for a long period of time. In the 3rd case, involving the vertebrae themselves, acupuncture can be very helpful in managing pain, but will not cure the condition, and the pain will tend to recur. Acupuncture reduces the inflammation of the sciatic nerve, which then reduces the symptoms that are distressing the patient. 1) Herniated disc. Needles are placed in acupuncture points on the low back to the side of the herniation at the level of the 4th and/or 5th lumbar vertebra, and then along the path of radiating pain, which can be in the gluteal area, the upper leg, the lower leg, and the foot. I often attach electrodes to certain needles and run a mild electric current along the pathway of discomfort to increase the pain-relieving effect of the treatment. 2) Tight piriformis muscle. The focus is on relaxing the muscle and relieving the pressure. The sciatic nerve passes under the piriformis in the deep gluteal area, and in some cases through it. Tightness of this muscle can press on the nerve. It is generally not necessary to treat for disc herniation in this case, and more attention is paid to palpation for tender areas in the gluteal region and applying needles there. Acupuncture is usually quite effective at relaxing a tight piriformis and reducing nerve irritation. Sometimes a disc herniation and tight piriformis exist together, in which case, we treat both. 3) Abnormalities of the vertebrae. Needles are placed in tender areas in the low back, glutes and legs. Usually, a mild electrical current is applied. The treatment goal is to reduce inflammation of the sciatic nerve and to loosen tight muscles. More on treatments: I also treat points on seemingly unrelated parts of the body that have been empirically shown to indirectly help sciatica. One of the fascinating things about acupuncture involves how one can treat a seemingly unrelated part of the body and get pain relief in another part. This effect often cannot be explained by Western medicine, but is perfectly understandable within the theoretical construct of Oriental medicine. It is difficult to say how many treatments are needed to significantly improve the condition. Different patients respond at different rates. I have had certain cases respond very well in very few treatments, especially if the pressure on the nerve is coming from a tight piriformis, as muscles can relax quickly. In cases of a herniated disc, generally more treatments are needed. It also needs to be said that not everyone responds to acupuncture, and if pressure on the nerve is the result of poorly-done surgery on the low back, or by pressure from the vertebrae themselves, the results are not as good, though often, in these cases, acupuncture can be effective at managing the pain. In general, though, I have noticed quite favorable results with the hundreds of sciatica patients I have treated over the years. My strategy is to suggest a trial of 4 treatments. Based on the progress, it is then easier to predict how many more treatments might be needed, if any. If the pain is gone before the trial is finished, we naturally discontinue, and I advise the patient to return only if necessary. I invite anyone with detailed questions to call or email me. I also invite you to read testimonials of patients I have treated who had sciatica. Further comments about disc herniation: I have often been asked whether acupuncture causes the disc protrusion to shrink. I don’t have an answer for this question because to my knowledge such a study has not been conducted. It would require before and after diagnostic imaging on a large number of people and would be very expensive. Patients ask me this question because when permanent relief is obtained, which it often is, it seems logical that this would result from the source of pressure being eliminated. Again, I don’t know. I can only discuss results, which are usually good. Could you have “pseudo sciatica”? Other tight muscles in the gluteal area can cause pain in the hip and leg without putting pressure on the sciatic nerve. Some doctors call this “pseudo-sciatica.” In this case, pain is caused by active trigger points in the muscles. Trigger points are hyper-irritable spots within a muscle or the fascia that surrounds it and can cause pain locally or refer it to distal sites. In this case, the focus of the treatment is to release the trigger points, and acupuncture is superb at doing this, especially when the acupuncturist understands trigger point pain patterns, which I am happy to say is one of my specialties.